Nauset Light is located within the boundaries of the Cape Cod National Seashore. The Nauset Light Preservation Society, an all-volunteer organization, has a partnership agreement with the National Park Service to operate, maintain, and interpret the Nauset Lighthouse site. The Nauset Light Preservation Society raised over $80,000 from private donations and secured federal grants totaling over $200,000 to fund the relocation and restoration of the lighthouse. The first lighthouse station for Eastham, known as the Nauset Beach Light Station (nicknamed The Three Sisters), was completed in 1838. It consisted of a group of three lights atop 15-foot high brick towers located approximately 800 feet east of where the present light now stands. Because of the encroaching cliff edge, the brick towers were replaced by three 22-foot high wooden lighthouses in 1892 and located thirty feet from the edge. In 1911, the continuously retreating shoreline made it necessary to move the lights again. Two of the towers were sold at auction. The third tower was moved back, put on a brick foundation, and attached to the keeper’s house. A rotating Fresnel lens flashing three times every ten seconds was installed.The present Nauset Lighthouse, which is listed on the National Register of Historic Places, is made of cast iron with a brick lining and stands 48 feet high. It was built in 1877, and was located in Chatham as a twin to the one that is there today. In 1923, the smaller wooden lighthouse in Eastham was retired, and the north tower in Chatham was dismantled, moved to Eastham, and reconstructed about 200 feet from the edge of the cliff near the relocated keeper’s house. 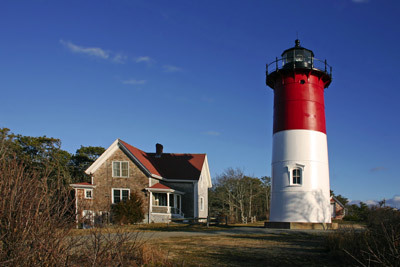 In the 1940s, Nauset Light was painted red and white as a daytime indicator of the red and white beacon. In November 1996 Nauset Lighthouse was sitting less than 35 feet from the edge of the eroding cliff when it was moved in one piece approximately 300 feet to a new site across the road. The lighthouse has been completely restored and is now preserved under a maintenance schedule. The NLPS provides public tours of Nauset Lighthouse and the oil house on Sundays May through late October and also on Wednesdays during July and August. Educational groups can arrange special tours of the lighthouse at any time of the year by emailing NLPS or calling our message service. Volunteers provide the historic background of the lighthouse station and conduct tours to the top of the tower. Tours are free and open to the public (donations accepted).